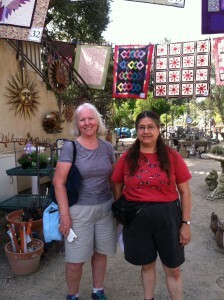 Here I am with my new friend June, at Quilting in the Garden in Livermore. I am now the co- workshop coordinator for EBHQ. I was worried that Sujata Shah’s workshops might be canceled because there weren’t enough people signed up. I sent an email to the Lib-Quilters, (an online quilt group I’ve been part of for years), that offered anyone in driving distance a place to stay for the weekend if they signed up for Sujata’s workshops. June was the only one to take me up on my offer. We had a wonderful weekend together. We have corresponded in the past, but this was the first time we ever met in person. In 2012 I wrote 300 words about why I love the Lib-Quilters for Quilters Newsletter Magazine. It’s on my blog on the “publications” page. This entry was posted in EBHQ, Lib-Quilters, Quilt Shows and tagged Alden lane nursery, quilting in the garden. Bookmark the permalink.